Recent research has shown a positive association between periodontal disease and heart disease. With heart disease being the leading cause of death in the United States, it is important that patients understand and recognize symptoms of a periodontal disease as well as proper treatment in order to prevent it leading to a more serious heart condition. But in order to do that, we need to understand how those diseases can be related. Scientist have determined that connection between oral and heart diseases is the associated bacteria. You can find the same bacteria around the infected gum tissue and the fatty deposits of atherosclerosis that you find in association with some heart disease. When bacteria in the gums breaks the barrier between the connective tissue and gums, the inflammation process begins. Bacteria then enters the bloodstream and can travel to other parts of the circulatory system, which can cause cardiovascular disease. When bacteria travels through the body it causes arterial plaque formation and fatty deposits. 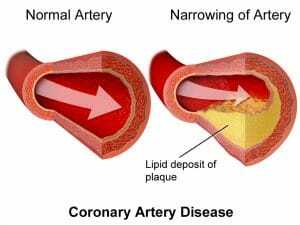 If the arteries narrow and clog the arteries with fatty deposits then the chances of heart attack or stroke increases. Periodontal disease not only causes tooth loss but it can lead to multiple other systemic diseases. It is important to seriously accept the treatment ordered by your doctor and to make sure that it is successful so that you can avoid it leading to other detrimental diseases. The most important thing, to begin with, is proper oral hygiene and regular teeth cleaning sessions. If your doctor diagnoses the disease and follows the correct treatment plan, they have the full set of tools to inform and educate the patient about all the warning signs and why it is important not to ignore them. Sometimes certain symptoms appear only in the latest stages of periodontal disease, so it is very important to do regularly scheduled checkups and to follow your periodontists’ recommendations. It is very common that many patients fear periodontal treatment and refuses to undergo any surgical treatment like soft-tissue, bone grafting, enamel matrix application, guided tissue regeneration or flap surgery. In order to remove all the damage that was caused by the periodontal disease, you need to remove all the bacteria and infection from the affected areas in your mouth. Dentists can help their patients get over their fear of modern technologies such as LANAP protocol. This alternative treatment is a laser procedure, which is less invasive and very patient-friendly. It is a great alternative for someone who fears painful scraping and scalpel surgery. At OC Smile Solutions we educate our patients about the connection between oral-systemic diseases and offer a big variety of options for periodontal disease treatment. Heart disease is the leading cause of death in the United States. If you have been diagnosed with Periodontal Disease, or feel any of the mentioned symptoms, it is vital that you take care of it properly before it leads to a more serious issue such as heart disease.